Editor’s note: This article has been republished as part of America’s special 110th anniversary issue. It was originally published Nov. 18, 1933. On November 7, Utah, the thirty-sixth State, adopted the Repeal Amendment, and Federal Prohibition came to an end. It has been a bitter experience, and a time of disaster. As the Archbishop of Cincinnati recently said, it gave rise to a long train of evils, “murder, dishonesty, hypocrisy, every form of bribery, the corruption of weak public officials, the increase of intemperance where it was almost unknown, contempt of law and, worst of all, the demoralization of our youth.” This may seem to be a severe indictment, but every word of it is fully justified. It was on August 1, 1917, when the country was at war, that this disastrous attack upon public and private peace and sobriety began. On that day, the Senate, to its shame be it spoken, submitted the Amendment to the States by a vote of 62 to 20. The late Vice-President Marshall, presiding on that day, later said that if the vote could have been taken in secret, the Amendment would certainly have been rejected. On December 17, of the same year, the House followed suit by a vote of 282 to 138. On November 21, 1918, following a campaign by Bishop Cannon and the late Wayne Wheeler, the whip was cracked again, and ten days after the Armistice a servile Congress voted to continue war-time Prohibition through the period of demobilization. On January 16, 1919, the Eighteenth Amendment was adopted by the vote of the thirty-sixth State, Nebraska. By October 27, 1919, the Volstead Act was adopted over the veto of President Wilson, and on January 16, 1920, the reign of lawlessness and corruption, private and official, began. By October 27, 1919, the Volstead Act was adopted over the veto of President Wilson, and on January 16, 1920, the reign of lawlessness and corruption, private and official, began. During the next five years, the Supreme Court upheld practically every point of legislation enacted to enforce the Amendment. During this same period, the criminal element, engaged up to 1920 in crimes against property and the person, organized the liquor trade, and the Government was never able to check it. To this day, it successfully defies the Government. Speakeasies and low dives took the place of the open saloon; gang leaders waxed fat in wealth and influence; and neither the Federal Government nor any of the States was able completely to withstand them. By 1925, the whole situation was not a national only, but an international disgrace. The response of the fanatical dry party, under the control of Wayne Wheeler and Bishop Cannon, supported by practically all the Protestant churches in the country, was black persecuting legislation. By this time these groups controlled the political parties, and members of Congress were freely permitted to drink wet, provided that they continued to vote dry. As Senator Reed, of Missouri, truthfully said, many a Congressman had to be awakened in time to vote for a new dry-bill with a whiskey breath. Not one of the alleged benefits of nation-wide Prohibition had come to pass. The poorhouses, the asylums, and the jails were not empty, but, on the contrary, for the first time in its history the Federal Government was obliged to build local jails, and the Federal courts were clogged, to the exclusion of far more important issues, with bootlegging cases. Meanwhile intemperance among the young and general disregard for authority grew to horrifying proportions. Writing in the New York Times for November 5, Amos W. Woodcock, late Federal Director of Prohibition, states that in the eastern part of the country, the most populous, it soon became apparent that Prohibition was doomed. For this he assigns two reasons; first, public opinion was opposed to the Eighteenth Amendment and, second, “we had to combat politics and legal delays.” What was true of the East, soon became true of by far the greater part of the country. But each new difficulty was met, as it arose, with more stringent legislation, to be met in turn by even more open defiance. As late as 1928, the fanatics were able to defeat Alfred E. Smith, who had declared against Prohibition. For this relief, we thank God. The downfall of Prohibition began, chronologically at least, with the Wickersham Report, January 20, 1931, juggled in its first publication, to please the dry faction. By 1932, the Prohibitionists had no standing with either party. “Prohibition is doomed,” said Franklin D. Roosevelt, in accepting the nomination for the Presidency. 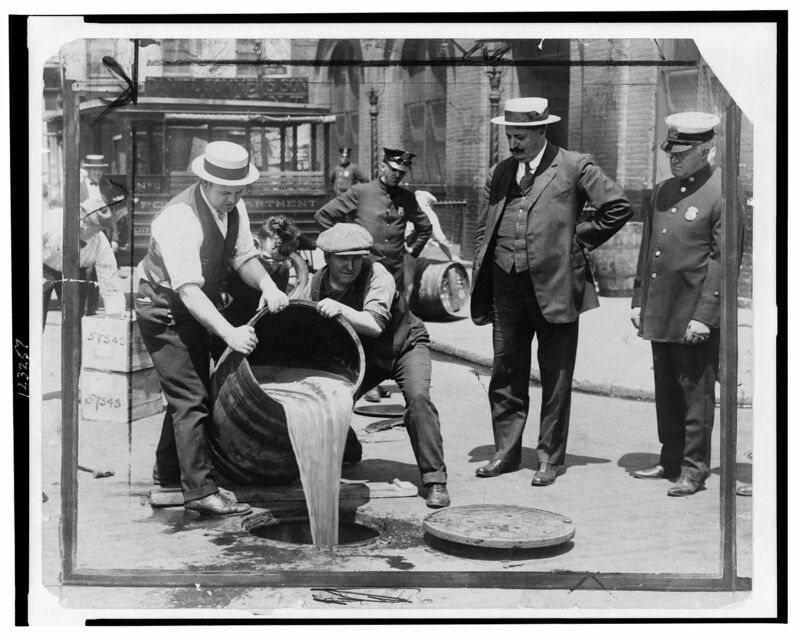 On April 7, 1933, the Collier bill, legalizing beer, was enacted by Congress, pending the complete overthrow of Prohibition. On February 16, 1933, fourteen years and one month after that fatal January 16, 1919, the Senate, by a vote of 63 to 23, submitted repeal of the Eighteenth Amendment to the States, and on February 20, the House concurred, voting 289 to 121. For this relief, we thank God. It is now our work to draw what profit we can from the direful experience of the last sixteen years, fourteen of them under the Eighteenth Amendment, and to look to the future. We have learned the folly, please God, of vesting the Federal Government with duties which under this form of government belong to the respective States. We have learned that it is a crime against civilization to substitute violence for the benign influence of religion. We have learned many other valuable truths, and by pondering upon them we shall at last learn how the traffic in alcoholic beverages can be controlled for the welfare of the country, and not for the triumph of fanatics and the enrichment of criminals. This article also appeared in print, under the headline " The End of Prohibition ," in the April 15, 2019 issue.